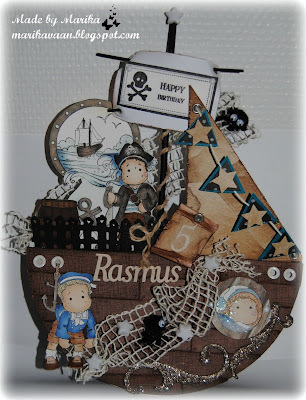 Nice Monday.I was able to make the GDT card TOMIC challenge #7 -Nautical theme.Truly wonderful to make a card for such a massive challenge.I was once a pirate ship. But this is definitely the best of my ships:)I made a card to my godson Rasmus. Because he wanted his cake spiders, I added them to the card:)I hope that you like the card and you'll get new ideas.Do not forget to look at what great cards TOMIC team has created this week. Mieletön kokonaisuus. Tämän tekemisessä on varmaan vierähtänyt tovi jos toinenkin. Kivoja lähikuvia yksityiskohdista. This is really an amazing project Marika. I love the creative way you made this ship card. Stunning work!! This is FREAKIN' AMAZING! So wonderful! I saw this at the TOMIC blog and immediately knew I had to come here and tell you how fabulous this is ! AMazing details! gorgeous Tildas! love the shape......did you use a template!?!? OMG! I could gawk at this all day! Thanks so much for sharing! A well deserved GDT position at the TOMIC challenge for sure! OMG this is absolutely drop dead amazing, holy cow there is so much perfection going on, I especially love Tilda peeking out the porthole. wow what a project, thanks so much for joining us at Magnolia Down Under this week! OMG this is amazing! How wonderfully creative, I love everything about it! WOW OMG!! This is absolutely amazing! Look at all that detail!! I can't get over all the work you put into it! Thanks so much for joining us at MDUC this week! Hugs! OH WOW!!! This is just stunning!!! Thank you for sharing with us at MAWTT this week, good luck! Amazing project Marika!! All of the elements used really do make this a stunner!! Thanks for joining us this week at MDUC this week. WOW WOW WOW this is totally awesome! Thanks for sharing your favourite things with us at MAWTT. what an amazing card, it's just out of this world.Goodluck at Charisma this week. Onnittelut Moving Along With the Times - blogivoitosta!! О! Такая восхитительная работа!!! Вы-умница!!! A great card, I love your star elements. Thanks for joining us at CCC. this is a real work of art! Wow!! wow!!! this work is woderful! Thanks for joining us at TSM challenge!